Bitcoinrush.io is a website that lacks everything. This is the first thing that I noticed about them. Seriously, they do. 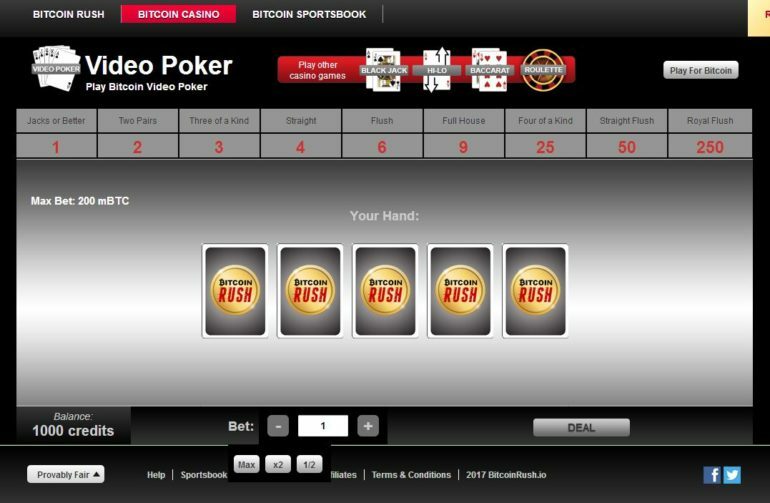 So what is Bitcoinrush.io? They have been in the Online Casino business since 2013 and they also claim that they are the first website that used “Provably Fair Bitcoin Casino” which is an online casino software that is being used by most of the Poker websites out there today that accept Bitcoin payments. They also have an affiliate program in which you can earn by inviting your friends to play with them. In this website, you do not see a lot of Poker games to choose from. They only have one Poker Game which is a video poker game. Too bad since we are after online Poker games to play with, right? Here are the games being offered on this website. To start the game you need to choose your Bet from the minimum of 1mBTC to 200mBTC, but the scroll only lets you bet up to 125mBTC. Once you have selected the amount you want to bet and click on “DEAL” for the machine to deal you five cards to choose from. You are now able to select which cards to hold at this moment. The cards that you have not held will be returned to the deck and new cards will be drawn by simply clicking on DRAW. 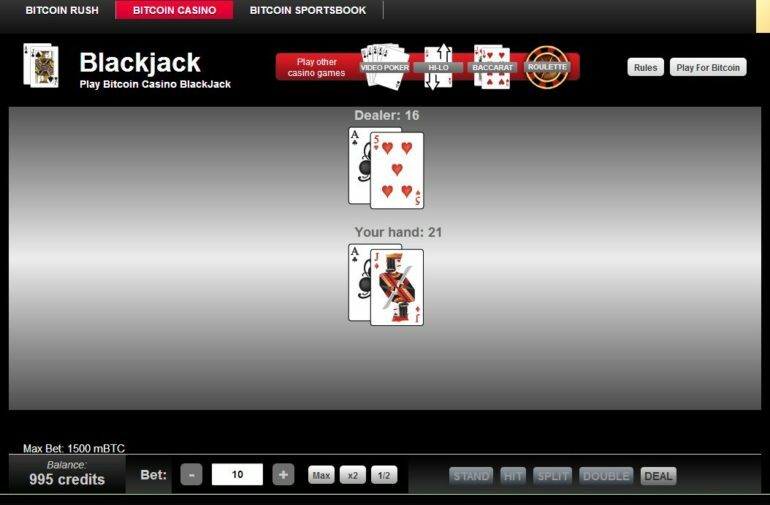 If you do not know how to play Blackjack you can read more about it through this link. The minimum bet is 0.001 and the maximum is 1000. Once you have decided how much you want to bet you just need to click on “DEAL” to start and the dealer gives out two cards to you. You are able to see one card face up on the dealer’s side to get an idea of what they have. You can use this advantage to strategically plan your moves to either STAND, HIT or DOUBLE. They also have Baccarat and Hi-Lo if you want to play these games. They even have Roulette if you feel extremely lucky! If you’re getting tired of their available casino games, you can always head over to their Bitcoin Sports book that has been hosting bets since 2013. These are the games below featured by their very own sports book. You might have noticed that I mentioned several times about the fact that this website does not offer that much when it comes to Poker games. It hasn’t changed after I looked into their casino games, they do lack a lot of things! And to have one Poker (machine)? That really is sad, but then again this might not be their concern. Since you are and are looking for a website that we can play Poker in, this is not one of those websites that I can recommend in playing at. Why? Well, there are a lot of websites out there that offer a lot more games than Bitcoinrush.io offers.